What makes My Father The Judge Cigars so exquisite among cigar connoisseurs is the gorgeous dark brown Sumatra Oscuro wrapper that bundles the three different Nicaraguan fillers enclosed with the Corojo & Criollo binders. All the ingredients of these amazing hand-rolled premium cigars are all grown locally on the Garcia's farms in Estelí, Nicaragua. My Father The Judge Cigars are hand-made creations comprised of complex flavors that are pleasingly medium-bodied, creamy and even sweet to the taste, yet still give a bold and balanced smoke. 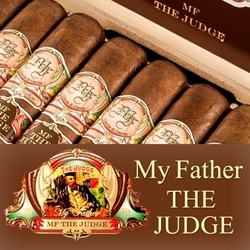 Smokers Discounts declares, Court is in session with the My Father's the Judge cigars. Try one of the varieties of sizes and flavors listed below. Each of these styles are available today for a discount price! Call us for more details!